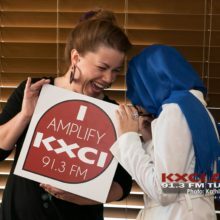 Mn Huna: Finding Refuge in Friendship is a KXCI 91.3 Community Radio mini-program. The hosts are Houda from Aleppo, Syria and Melanie from Tucson, Arizona, USA. You can contact us via email. Houda arrived as a refugee in Tucson with her parents and younger sister in July of 2016 at the age of 18. Her older sister and her sister’s husband and infant daughter are still in Jordan waiting for resettlement. Houda graduated high school in Jordan, but was placed in 9th grade in Tucson. She aspires to a career that combines her interest in journalism and political science. Melanie moved to Tucson in 1991 when she was 20. She has an MFA in poetry from the University of Michigan and is a member of Arizona Welcomes Refugees. Melanie & Houda met at a potluck hosted by Arizona Welcomes Refugees a few weeks after Houda’s family arrived, and have become friends. Though their friendship crosses generations, language, religion, countries, and life experiences, they have much in common: a love for writing and literature, a belief in the power of telling our stories, and a desire to make the world a better place for all people. “Mn huna” is Arabic for “from here.” The show focuses on the experiences of people who have been resettled to Tucson as refugees and how they feel in their new country. The theme music is “Naouetb Asibak,” a famous Syrian piece, arranged and performed by Fadi Iskander and Tamara Khachatryan (both from Aleppo) with ChamberLab in Tucson. Translation support by Safa Najjar Merheb. Production by Rusty Boulet-Stephenson. Photo by Kathleen Dreier Photography.